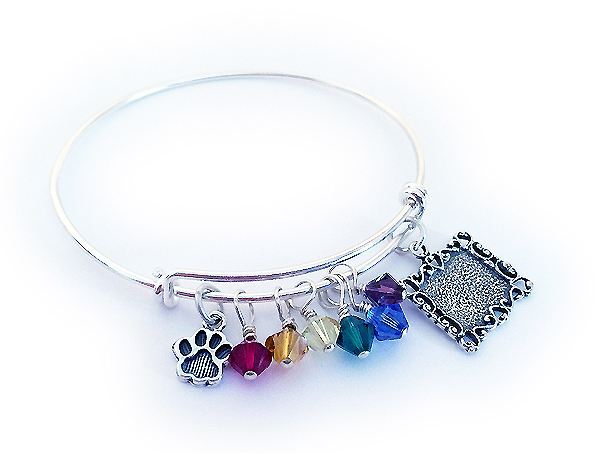 This Rainbow Bridge Bangle Bracelet comes in sterling silver or silver tone with 6 Swarovski Crystals in the colors of the rainbow, 1 Paw Print Charm and 1 Picture Frame Charm. Please send me a picture of your beloved pet after you place your order and I will insert it for you (you may also do it yourself when you get it in the mail). The bracelet is one-size-fits-all and it fits an average size wrist. You will have the opportunity to add additional charms, if you would like or need more than 1 picture frame charm.